I know what you’re thinking: the Texas-built Hennessey Venom GT is good and all, I guess, but maybe it’s just a little underpowered? Maybe 1,244 horsepower isn’t quite enough to get the job done? It may be the fastest car in the world, but... ehh? Fortunately Hennessey is here with a solution, and that solution is MORE POWER. This is America. We can fix any problem with MORE POWER. The Texas tuner announced that the Venom GT now packs 1,451 HP, up 207 HP (a whole GTI’s worth, basically) over the old car. It can now run on E85 FlexFuel, which allows boost on the twin-turbo 7.0-liter engine to get cranked up from 19 psi to 26 psi. Hennessey projects the new car will do zero to 60 mph in 2.4 seconds, zero to 200 mph in 12.8 seconds, and should hit a top speed of more than 280 mph. The new car will be on display at SEMA with several other Hennessey models. 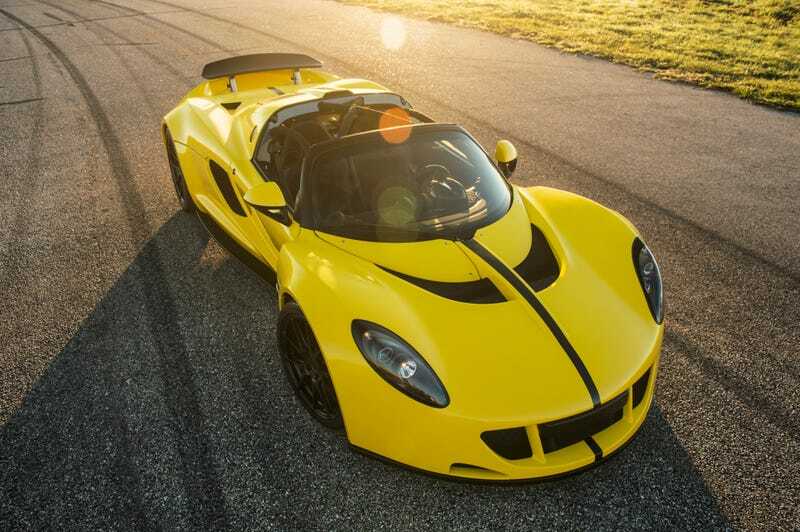 John Hennessey said in a news release that only a handful more Venom GTs will be released in 2016 before the company moves on to its next evolution, the Venom F5.